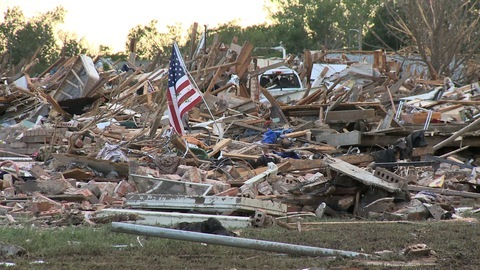 My Two Hours in Moore, Okla.
An American flag stands amid the rubble of the May 20 tornado that tore through Moore, Okla. Photo by Rebecca Jacobson. I’ve driven through Oklahoma many times, usually once or twice a year as my family traveled from our home in Omaha, Neb., to visit relatives in Dallas. And every Valentine’s Day, I’d cross through Moore on the way to visit my boyfriend, who was a graduate student in the nearby city of Norman. On Tuesday, I returned to Moore, having been given the rare opportunity to join the organization Save the Children on a two-hour tour of the tornado damage. The city I’d come to know was unrecognizable. Debris was everywhere I looked and yet at first glance it all looked like nothing — an incomprehensible mass of rubble. But slowly, I began to identify things: an overturned clawfoot bathtub, remote controls, toys, street signs, dishes. A mess of twisted metal was formerly the front end of a BMW; the spot where I stood was once someone’s house. Metal guard rails wrapped around the few remaining telephone poles and trees like twist ties. 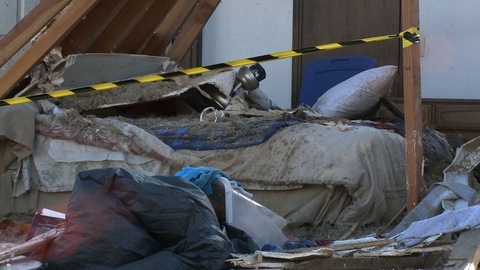 The wall of one home had been sheared off, leaving a bedroom exposed. The sheets were still on the bed. Residents silently picked through the rubble, collecting what belongings they could. Across Telephone Road was Moore Medical Center. The top floor, which used to house the maternity wing, was gone. Walls of the building had collapsed. Windows had shattered. Dozens of crumpled vehicles were stacked in the medical center’s parking lot. Emergency personnel had marked the destroyed vehicles with pink and orange paint to show that each had been searched for victims. Sgt. Johnny Hernandez of the Dibble Police Department pointed to a black mark where a car had slammed into the hospital during the storm, blocking the exit door. He was here during the tornado of 1999, too. At least the storm left the pavement intact this time, he said. “I think I’ve seen enough storms for a while,” he added. During the storm, Derek Thayer, a physical therapy assistant at the medical center, had guided patients to the cafeteria for shelter. Fortunately, the hospital had no storm-related fatalities. Two women went into labor during the tornado; both babies were healthy. As I walked through the rubble, I noticed that none of the homes I saw had basements or storm cellars. Moore had also suffered an F5 tornado in 1999 — that’s the most damaging rating on the Fujita scale — along with large tornadoes in 2003 and 2008. But despite the many storms, fewer than 10 percent of homes in Moore have below-ground storm shelters, according to the city’s website. Few homes in Oklahoma are built with basements, due to the area’s tough soil, Robert Henson of the National Center for Atmospheric Research told the NewsHour on Tuesday. After the 1999 tornado, FEMA investment and other grants helped Moore erect new storm shelters: reinforced structures usually made out of concrete and designed to withstand a 2-foot by 4-foot beam slamming into it after traveling through winds exceeding 100 mph. Now the Oklahoma City suburb has 3,170 storm shelters, but the grants have recently expired, leaving low-income families without the option to buy the $2,000 to $3,000 structures, said Elizabeth Jones, community development director for the city. No local or international building codes require any building to have a storm shelter, said Tim Reinhold of the Institute for Business and Home Safety, even in tornado-prone areas. 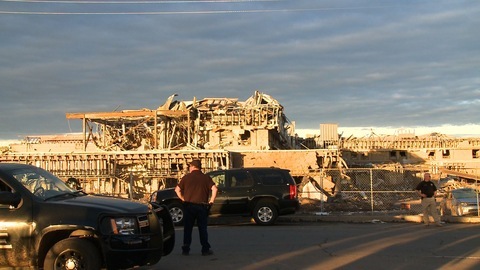 This time, nature took its toll on two elementary schools — Briarwood Elementary School and Plaza Towers Elementary School, where seven children died during the tornado. The leaders of Save the Children have a common complaint about disaster planning: Emergency plans don’t always account for the unique needs of children. Diapers, pediatric splints and medication, for example, are often needed and lacking. In this case, according to a recent CBS News report, Plaza Towers Elementary had no storm shelter. Jones said that since 1999, some new schools built in Oklahoma have tornado-safe rooms or shelters, but it isn’t a requirement. The community is in discussions about making such shelters mandatory.